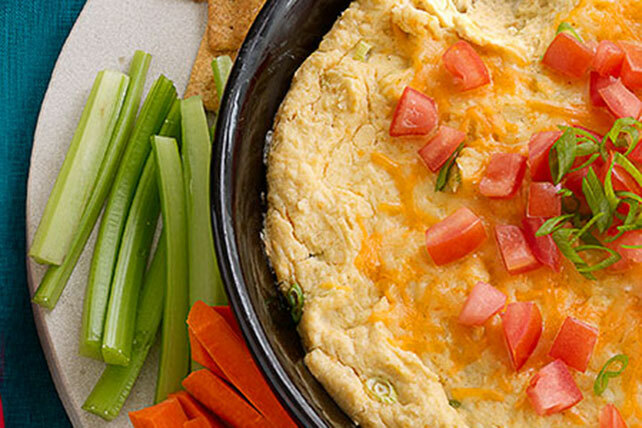 The combination of the garbanzo beans with the Philadelphia Cream Cheese makes this a very creamy dip! Preheat oven to 350°F. Place beans, 1 cup of the cheese, cream cheese, sour cream and ground red pepper in blender or food processor container; cover. Blend until smooth. Stir in green onions. Bake 20 min. or until lightly golden brown. Top with remaining 1/2 cup cheese and tomato. Serve with crackers. Prepare as directed except for baking; cover. Refrigerate overnight. When ready to serve, bake, uncovered, 25 min.